Help me complete this map! 1. Click on the map to enlarge it, selecting either the U. S. or Canada. 2. Click again to zoom in more. 3. Click on a state or province to listen to audio or video samples for each location. Most Common Second and Third Languages by State in the U.S.
A group of linguists had been gathering data on North American English dialects using a web-based survey. They asked for our help, and some of you helped with this survey. This survey is now closed, with 3903 total responses in December 2012. You can see some preliminary results at: pantheon.yale.edu/~clb3/NorthAmericanDialects. This is just a hobby of mine, that I thought might be interesting to a lot of people. Some people collect stamps. Others collect coins. I collect dialects. - Rick Aschmann. (Page last updated: May 2, 2018. The many subdialects are shown in red on the map and in the chart, and are outlined with red lines on the map. All of these are listed in the margins of the map as well. In the Dialect Description Chart additional features not shown on the map are provided for distinguishing the dialects. What’s New? All additions or changes within the last few months are marked with “ New! ” and the date, or with “ Adj. ” (for “Adjusted”.) To see this new information, simply search for these words. this one, set up on December 27, 2010.
this one, set up on November, 2009. How Many Vowels are there in American English? Did the cot-caught merger come from Scotland? What’s the Difference between Inland Southern and Lowland Southern? Where do they speak without an accent? Or where do they speak “General American”? Do some geographic features coincide with dialect boundaries or areas? Do state or provincial borders coincide with dialect boundaries? Which states are the most linguistically complex? Several people have asked if I intend to make posters of this map. I do not! I’m not going to get into marketing my hobby! However, I wanted a poster myself, so I figured out how to print it out in pieces and tape it together. You can do the same. It will print out on 9 pieces of standard letter size paper (81/2 x 11 inches), and you will then need to trim the inner margins with scissors or a paper cutter, and then tape the pieces together. I ended up with a nice poster, and you can too. Click here to open the printable PDF file. After you have opened it, you can print it directly to your printer. I don’t promise to update this PDF each time I update the map, but I’ll try to update it fairly frequently. This PDF was last updated on: May 2, 2018. A description of each layer and suggestions can be found here. 5: Bite-bout line: See Map 14.1 in ANAE chapter 14. Like Western North, but “cot”=“caught”. Subtle differences from the rest of the North Central, particularly /ŧħ/ [ð] becomes /d/ [d]. Vowel of “too” significantly more fronted than vowel of “toe”, “cot”=“caught”. Same as West, but “cot”≠“caught”. Like the Atlantic Provinces, but with a strong Irish component. “far” & “father” fronted to [a], systematic r-dropping, “cot”=“caught”, “father” [a] & “bother” [ɒə] don’t rhyme. Vowel of “far” fronted (but not “father”), “cot”=“caught”. Back vowels strongly backed, defined as the “cot”≠“caught” area north of the line of yellow dots, except for the St. Louis Corridor. Least distinctive dialect of the North, some sections are “General American”. Northern Cities Shift: /ă/ in “bat” strongly raised to [eə], most short vowels shifted. Northern Cities Shift: /ă/ in “bat” strongly raised to [eə], most short vowels shifted, but many other vowels like Midland. Very similar to Western North, but separated from it geographically. Mostly like Western North, but some similarities to Greater New York City. Many vowels like Greater New York City, but no r-dropping. /ă/ in “cat” central [a], systematic r-dropping, “cart”=“cot”, which is not seen anywhere else in the world! A lot like Greater New York City, but more research needed! In many ways is intermediate between Northern and Southern. Many vowels are pronounced like Greater New York City, “pin”≠“pen”, unlike the surrounding area. “cot”=“caught”, unlike most of Midland. Pittsburgh vowel shift: “out” is pronounced [ˈat], with no diphthong, the way a Bostonian says “art”. Like the parts of the Central Midland south of the pin-pen line. Like the Central Midland, with influences from Atlantic Midland. “bad” does not rhyme with “had”, like Greater New York City, but otherwise like East Midland. “cot”≠“caught” like Central Midland, “pin”=“pen”. Partial to full Southern shift: vowels of “ride” and “buy” have no diphthong: long /ī/ is [a]. In almost entire area “pin”=“pen”, except as noted below or on map. Partial Southern shift: long /ī/ vowels of “ride” and “buy” have [a], with no diphthong, but “right” is [aɪ]. Outlined in dark green rather than red, a catch-all for all R-dropping dialects in the South, includes or cuts across some of the dialects below. East is R-dropping, west apparently not, “pin”=“pen”, French influence, th > t,d. Full Southern shift: vowels of “ride”, “buy”, and “right” all have [a], with no diphthong. No Southern shift, R-dropping, vowels of “bait” and “boat” are not diphthongs, but simple [e] and [o]. No Southern shift, long /ī/ [ɒɪ] vowel often almost like /oi/ [ɔɪ], “pin”=“pen”. No Southern shift, long /ī/ [ɒɪ] vowel less like /oi/ [ɔɪ] than Down East & Outer Banks, “pin”≠“pen”. 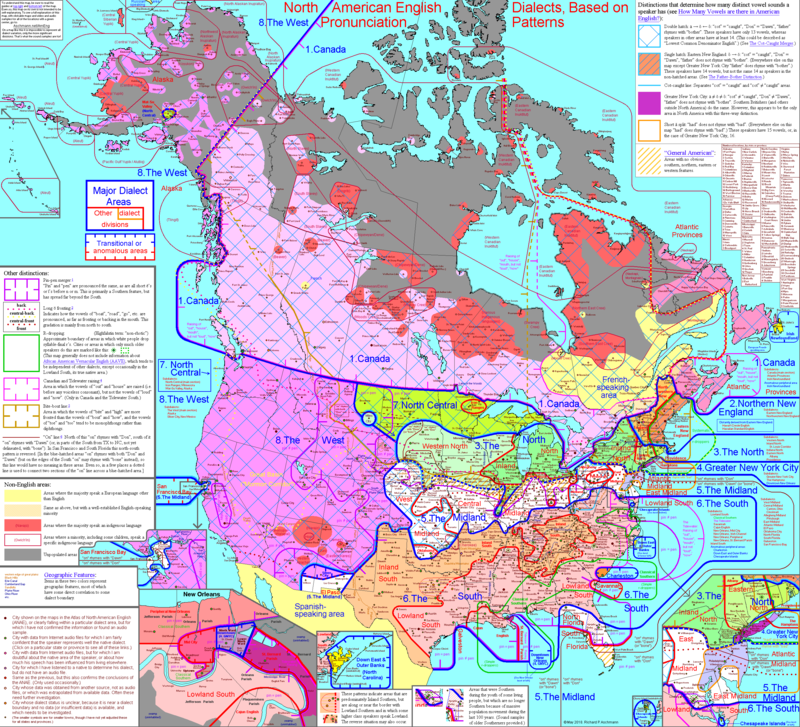 * Those dialects marked with an asterisk are not in the Atlas of North American English (ANAE). This site has been completely redone, perhaps in 2013, and is vastly improved, since it now provides a lot more information about the speakers, including place of birth and sometimes a list of places where they have lived, plus a lot of other information! However, I still find that many of the samples do not represent well the bedrock pronunciation of the area, but instead represent those who have tried to sound less “local”. Also, locations are often limited (though I see that more have been added recently), and often only urban locations are given. Even so, in many cases the data is useful, and I have used it in the sound samples below, especially when clearer indications are given of “nativeness”, and now that more information has been provided, I will probably add more. If anyone finds any of these that I have left out and shouldn’t have, please let me know! Samples only from north-central U. S.
2. I do not separate syllables with a hyphen except when absolutely necessary, as in “cartridge” /kärtrij/ versus “cartwright” /kärt-rīt/, or “mission” /mĭshən/ versus “mishap” /mĭs-hăp/; although technically in these two cases the underlining of the primary-stressed syllable gives enough information, even so the hyphens help to clarify. The remaining columns show what happens to vowels before final r, showing the “R-colored” vowels used in most of North America, and showing the Southern System in the final column, representing the system used in much of the South, which does not have “R-colored” vowels. If anyone finds that any of the symbols in the chart do not display properly on their web browsers, please let me know. Most of them are standard Unicode characters. “Mary” /mārĭ/ [ˈmɛɪɹɪ] are different. Black: The black vowels are those which all Americans have as distinct vowels. Green: The green vowels are those which a small minority of Americans have, as distinguished from the other vowels, in particular regions or dialects. † The /yōō/ sound is not a single sound, but is simply /y/ followed by /ōō/. Thus, there really is no “long /ū/” vowel. Similarly, /yŏŏr/ is simply /y/ followed by /ŏŏr/. *These often have an aspirated allophone, e.g. [kʰ], which I have represented in the phonetic guide for many names, though not in the phonemic guide. What about words like “hire” or “sour”? Aren’t these additional vowels that can come before /r/? At first glance it might seem so, but in fact, in most if not all English dialects, these words actually rhyme with words like “higher” and “power”, meaning that they are actually two-syllable words pronounced /hīər/ [ˈhaɪɚ] and /souər/ [ˈsaʊɚ], so no new vowel before /r/ occurs. For r-droppers the /r/ itself is usually dropped, but the vowel still remains unique, in most cases different from the ordinary vowels.